Although New Jersey Gov. Phil Murphy recently signed a law to save three struggling nuclear plants in the state, that rescue plan doesn’t include Exelon’s Oyster Creek nuclear-generating station. The facility, the oldest still operating in the U.S., sits alongside Barnegat Bay in Ocean County’s Lacey Township. It will permanently shut down Sept. 17, according to Exelon’s Post-Shutdown Decommissioning Activities Report submitted to the U.S. Nuclear Regulatory Commission in May. Decommissioning costs are approximately $1.4 billion, and the NRC said the company already has $945 million in its decommissioning fund. But the actual removal of components and decontamination of the site won’t start until 2075, according to the document. For the intervening 57 years, the plant will be in “safe and storage” condition, one of the three options nuclear plant owners have for decommissioning a facility. 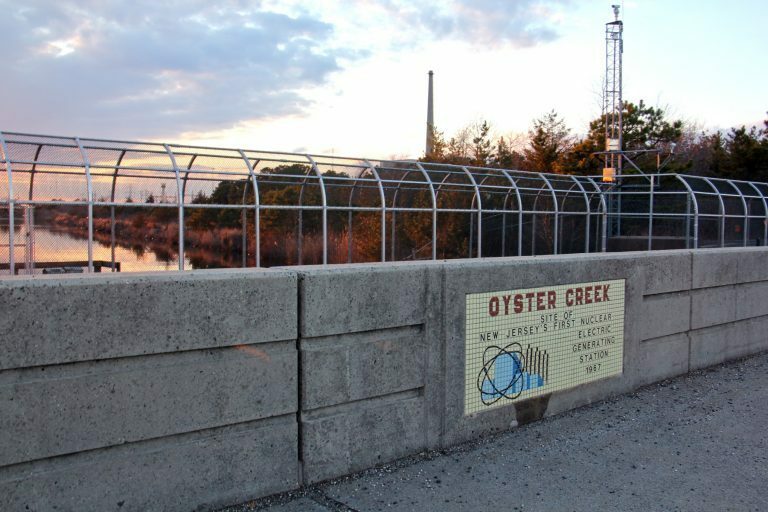 “Fifty years from now is an awful long time, especially in an ever-changing coastal area, and I think it’s way too long to wait,” said Jeff Tittel, director of the New Jersey Sierra Club. The Oyster Creek nuclear plant is located only a few miles from the beach. Tittel and residents of the homes and townships surrounding the plant worry rising sea levels and stronger storms could flood the facility. During Hurricane Sandy, the plant went into alert mode because of storm surge, Tittel said. “The longer we wait, the longer things sit there, the more chances of another storm that could be even worse than Sandy hits the plant, spreading that radiation into the community behind it,” Tittel said. In a Monday presentation, NRC representatives assured residents that won’t happen. The site is located more than 20 feet above sea level, and the NRC continuously assesses climate change impacts. Exelon plans to move the spent fuel from pools to dry casks units within six years. And once that happens, the risks will be minimal, said Bruce Watson, chief of NRC’s reactor decommissioning branch. One inspector will remain onsite for an indeterminate period of time, according to the NRC. After that, staff in the regional office will conduct yearly inspections. Dry cask storage has been safely used in since the 1980s, and its safety has been tested to resist natural disasters and terrorist attacks, said NRC spokesman Neil Sheehan. “These casks have been subjected to all kinds of tests including submersion — they’ve been dropped, they’ve been ignited, there’ve been a variety of tests and conditions that they’ve been subjected to,” he said. The plant now is using 34 dry casks, which are located on concrete pads that take up “just a small fraction” of the 800-acre facility, according to Sheehan. To store the fuel currently cooling off in pools, Oyster Creek will need about 40 additional dry casks and might have to expand the pad, a process that could take about one year. Exelon spokeswoman Suzanne D’Ambrosio said the “safe and storage” alternative, in which a facility is left intact but the fuel is removed from the reactor vessel, is the cheapest and safest decommissioning option. “It allows for normal radioactive decay, produces less waste, and exposes our workers to lower levels of radiation,” she said in an email. According to the NRC, 10 nuclear plants in the U.S. have conducted decommissioning shortly after a shutdown, with the total process taking seven to 10 years. Currently, six plants are actively decommissioning, and 14 units are in the “safe and storage” condition process, where decommissioning starts after 10 to 30 years. Without a federal plan to store nuclear waste, Lacey Township will have to host that waste for years. In April, township officials demanded the federal government compensate host communities for keeping the fuel in town. Lacey residents worry that with the nuclear plant shutting down, their taxes will go up, people will move out, and property values will drop. Watson said the NRC does not regulate or require any kind of compensation for the community. “I believe the local community can continue to assess property taxes and some other local taxes on the facility, but there is no NRC requirement,” he said. The Nuclear Regulatory Commission will hold a public meeting in Lacey Township on July 17 to hear public comments on Exelon’s plans for dismantling the plant.